Best Value! Ocean Front/View 133 Great Reviews! Pool Sleeps4 Just Steps to Sand! Better Than a Hotel! Ocean Front/View! Rental unit is directly on the ocean. The ocean is visible and there are no other properties between this property and the ocean. This 3rd floor unit has a great location at 4667 Ocean Blvd, San Diego, CA 92109, USA. Web search the address to see it's oceanfront spot. Walk out the front door of the complex and be greeted by a stunning view of the Pacific Ocean or enjoy the most beautiful sunsets. The unit's main window has a nice view of the Crystal Pier and the surfer's that enjoy the break there. The beautiful sounds of the ocean are easily heard from the unit. Very convenient location to the San Diego airport. The unit has Wifi access and a dedicated underground parking space (6'height limit). Pacific beach is located off I-5 and Garnet Ave. The beach area south of Crystal Pier is known as Pacific beach. It is a two-mile stretch of sandy beach packed with people, fun waves, an active boardwalk and plenty of space to sunbathe. North Pacific beach is located north of Crystal Pier, a public pier good for strolling and fishing. The city of Pacific Beach is vibrant and hip. The main streets of Garnet and Grand, which lead to the beach, are lined with shops, bars, restaurants and novelty stores. The Pacific Beach crowd really is unique and make for a fun beach experience. It’s an eccentric community, which ranges from the casual surfer to the tattooed punk rocker to the average college kid. Needless to say it’s a fun place to people watch. The boardwalk parallels the beach and is lined with shops, restaurants, beach rentals and some apartments for the lucky few who get to enjoy a beautiful beach sunset from their doorstep and a crazy and exciting town just around the corner. The boardwalk is popular all throughout the day and a great place for cycling, jogging, walking or rollerblading. Almost all water activities are practiced at this beach from surfing, to boogie boarding, swimming and skim boarding. Surfing is popular at this beach. The waves are fun and depending on the conditions can be suitable for all levels of surfing. There are however separate areas for surfing and swimming. Flags are usually posted to indicate the designated surfing areas. Lifeguards are on duty year round. Making your vacation excellent in every way is my #1 commitment and customer service and relations is something I pride myself in. Read my reviews to see that others agree! Pacific Beach exudes the essence of a true California beach town with its brilliant, year-round sunshine and blue ocean swells that greet its sand and boardwalks. This small, colorful community blends an eccentric mix of surfers, local beach bums, college students, professionals, and families. A few blocks west of Pacific Beach, you’ll find a fun jumble of surf shops, taco stands, craft galleries, hotels and smoke shops flavored with a hint of tie-dye. The architecture here is varied, with 30s-style beachfront cottages next to large, upscale, earth-toned hotels and condos. Expect ultra casual and zero attitude in Pacific Beach. For a less crowded alternative, try the more protected waters of Mission Bay, located just four blocks east of the south end of Pacific Beach. The Unique Benefits at this Condo: Between the ocean, the bay, and nearly 15 miles of bike paths — not to mention year-round sunshine — Pacific Beach offers a myriad of recreational activities for families, weekend warriors, and outdoor enthusiasts. Surf, swim, kayak, or body board in the blue waters of the ocean. Bicyclists, skaters, walkers, and joggers have miles of paved paths winding between the ocean and Mission Bay. The paths afford spectacular views of the beach and bay; they also offer up a slice of local life at Pacific Beach, including neighborhood basketball games, family picnics, Frisbee, and kite activities, and lots of outdoor barbecues. Sunbathing opportunities abound on the ocean, the bay, or a quiet grassy knoll. With the endless supply of ocean and sand at Pacific Beach, parents will never hear the words “I’m bored” from their kids. 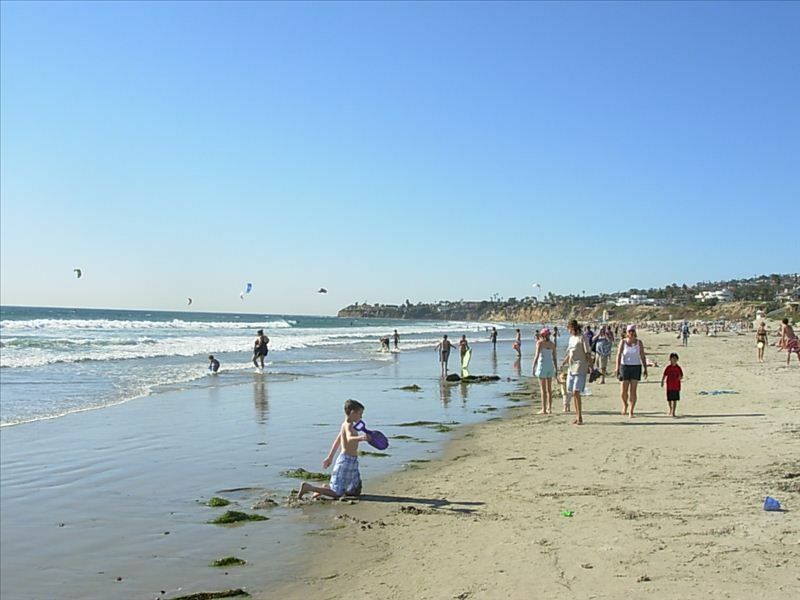 Pacific Beach is a saltwater playground offering all the activities kids love — building sand castles, splashing in the ocean, or (for bigger kids) romping through the waves on a body board. The beach isn’t the only happening scene in Pacific Beach. Shoppers will find dozens of funky, eclectic surf shops, clothing stores, smoke shops, and craft galleries along Mission Boulevard and on Grand and Garnet Avenues. You can rent surfboards, body boards, roller blades, and bicycles at shops located near Crystal Pier. Lifeguards are stationed at Pacific Beach year-round. Pets are permitted from 6 a.m. to 9 p.m. and must be on a leash. Parking at Pacific Beach is easy most weekdays during the winter. However, it will be challenging on weekends and on any day during the summer. Walk out the front door for a stunning view of the Pacific Ocean! Now with two new big flat screen T.V.'s! Beautyfull view on the Pacific. Conveniant and clean house. Everything you need for a pleasant stay is there. The instructions up front are good and clear. Great location, in the heart of PB. So much fun in San Diego! We stayed in this condo for a week and really had a wonderful time. The location was perfect! We loved being so close to the ocean and being able to watch surfers from the living room! There is so much to do and see there! The condo had everything we needed and worked great for us. Dean is very kind and very responsive to messages. It was a great vacation! Thank you so much for the review! I'm glad you enjoyed your stay and made our place part of your vacation plans! Great location, right next to the ocean. The condo is small, but that is to be expected. The unit doesn't directly face the ocean, but still has quite nice view from the living room. Owner is nice and responsive. Had a great time! Place is as seen in the photos, great location by the water. Would have no hesitation renting again in the future. Thanks for a great stay! Thank you for your review and thank you for your stay! very good location, you can see the sun come up and go down from the front window. You can see the surfers out front on the ocean. The boardwalk was very nice which is right in front of the condo, close to everything. Thank you very much for your review. I am glad the weather was so good while you were here! Hopefully you can find a time to come for another visit. Julian or Temecula Wine Country. River Walk Course, Four Seasons Aviara and many more.